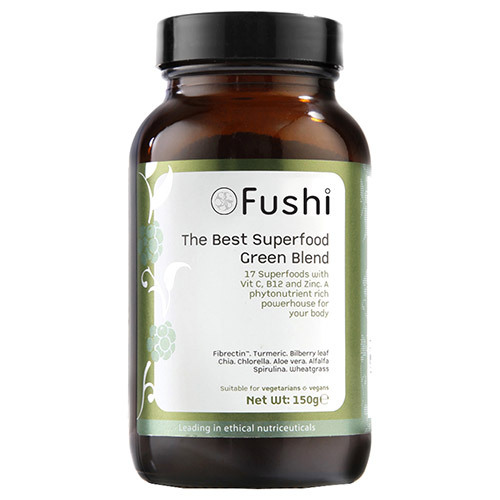 The Best Superfood Green Blend contains a whopping 17 powerful superfoods together with vitamins C, Zinc and B12. This is a truly potent phytonutrient powerhouse that provides nutrient dense food and has an alkalising action on the body. It has been formulated by the experts at Fushi using Fibrectin™, a combination of raw Australian apple powder, kelp and apple pectin. The blend contains blue green algae, spirulina and chlorella which are all algae superfoods that have detoxifying and cleansing properties. Spirulina is high in protein and vitamin B12 making it the perfect supplement to help provide energy and immune support. It also includes wheat grass which is high in beta carotene, amino acids, iron and calcium as well as barley grass, which is rich in antioxidants. Other greens in this blend include spinach, high in vitamin K and apple powder to relieve bloating and calm the digestive system. Hemp has been added to provide EFA’s (essential fatty acid`s), iron and vitamin E. The blend also contains alfalfa and chia seeds which are both high in dietary fibre and B vitamins. Kelp and bilberry are included to help with cellular metabolism and decrease cravings. Turmeric has been added for its anti-inflammatory and anti-carcinogenic properties while the high quality South African aloe helps to soothe the gut. Lastly, it contains quinoa, an ancient Incan superfood to seal the deal with its high protein profile and plentiful amino acids, making it the perfect choice for vegetarians. Fibrectin™ (Blend of Raw Australian Apple Powder*, Apple Pectin, Kelp extract 4:1 (Laminara Digitara)) , Blue Green Algae min 55% protein (Arthrospia platensis)*, Spirulina whole plant min 50% protein (Spirulina platensis)*, Raw Organic Chlorella Powder (Chlorella pyrenoidosa)*, Raw Organic Wheatgrass Sprouts min 20% protein (Triticum aestivum L)*, Raw Organic Barley Grass (Hordeum vulgare)*, Raw Spinach (Spinaciae oleraceae folium pulv)*, Raw Egyption Peppermint leaves (Mentha Piperita)*, Natural Xylitol derived from Corn Cob, Raw Hemp powder min 50% fibre (Cannabis sativa)*, Bilberry leaf extract 4:1 Active Anthocyanidins, Raw Alfalfa powder (Medicao sativa)*, Raw Chia seeds whole (Salvia hispanica)*, South African Aloe vera (Aloe barbadensis)*, Indian Tumeric (Curcuma longa), Raw Quinoa (Chenopodium quinoa)*, Naturally derived Vitamin C (Ascorbic acid), Zinc sulphate, Vitamin B12. 5g-10g (1 tea spoon = 5g) daily mixed with fruit juice or smoothie. 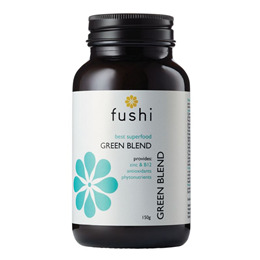 Below are reviews of Fushi The Best Superfood - Green Blend - 150g by bodykind customers. If you have tried this product we'd love to hear what you think so please leave a review.